Learn more about all of the available Gear Sets in Tom Clancy's The Division 2. In Tom Clancy’s The Division 2, there are a variety of Gear Sets that you can earn and equip. As of right now, there are three different Gear Sets available, with each Gear Set offering its own array of unique perks and buffs. If you’re curious as to what each Gear Set is, and the benefits associated with each Gear Set, we’ve got you covered. Below, we’ve put together a quick list breaking down all three Gear Sets in Tom Clancy’s The Division 2! There are three different Gear Sets available in Tom Clancy's The Division 2. As noted above, there are three different Gear Sets in total in Tom Clancy’s The Division 2. 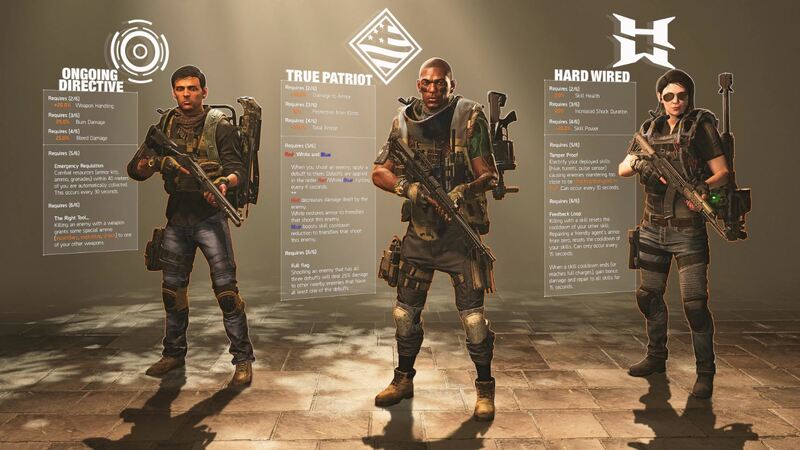 The Gear Sets available in Tom Clancy’s The Division 2 include the True Patriot, Hard Wired, and Ongoing Directive. Each of these Gear Sets offer a variety of debuffs, buffs, and special abilities for players to take advantage of. Depending on your personal preference, and how you plan on playing the game, some Gear Sets may work better for you than others. Alternatively, tracking down all three Gear Sets can be a fun process, and it can be convenient to have the ability to switch between Gear Sets depending on the circumstance and situation. Each Gear Set contains six different pieces in total. Once you’ve acquired two or more pieces to a Gear Set, you’ll begin receiving perks. For example, having two pieces of the Hard Wired Gear Set gives you 20% skill health. Below, we’ve listed all three Gear Sets, and the perks in relation to the number of pieces you own in Tom Clancy’s The Division 2! Shoutout to Shacknews for Gear Set perk, debuff, and buff info. Two Pieces: Deal 10% additional damage to enemy armor. Three Pieces: Adds an additional 10% protection against damage done by elites. Four Pieces: Receive 10% total armor to your agent. Five Pieces: Unlocks Red, White, and Blue Debuffs where every enemy damaged over a certain threshold amount gains a debuff. The Red debuff decreases damage dealt by the enemy. The White debuff restores armor to the ally shooting the debuffed enemy. The Blue debuff lowers the Agent’s skill cooldown timers. Six Pieces: Unlocks the Full Flag Perk where shooting an enemy with all three Red, White, and Blue debuffs adds 25% incoming damage to nearby enemies. Two Pieces: Receive 20% skill health. Three Pieces: 20% increase in shock resistance. Four Pieces: 20% increase in skill power. Five Pieces: Unlocks the Tamper Proof Perk which causes enemies to get shocked by placed skills. Six Pieces: Unlocks Feedback Loop Perk which causes skill-based kills to reset skill cooldown timers. Once skill cooldowns are complete, you’ll receive bonus skill and repair effectiveness for 15 seconds. Two Pieces: 20% increase in weapon handling. Three Pieces: Deal an additional 25% burn damage. Four Pieces: Deal additional 25% bleed damage. Five Pieces: Unlocks Emergency Requisition Perk which lets your Agent automatically pick up nearby items within a 40-meter radius every 30 seconds. Six Pieces: Unlocks The Right Tool Perk which causes weapons to collect elemental ammo for each enemy killed. For more on how to farm all three Gear Sets in Tom Clancy's The Division 2, be sure to check out the helpful video below courtesy of YouTube user, Mtashed. Now that you know what all three Gear Sets are and their special perks, buffs, and debuffs, be sure to check out some of our other guides for Tom Clancy’s The Division 2 including how to get the Chatterbox SMG in Tom Clancy’s The Division 2, how to get the 12 Hunter Masks in Tom Clancy’s The Division 2, and how to join Clans in Tom Clancy’s The Division 2.